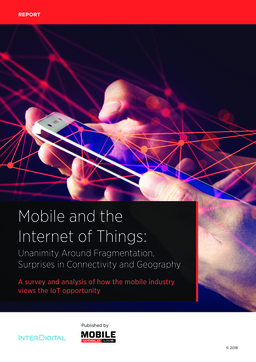 To research the future of the Internet of Things (IoT), Mobile World Live conducted an online survey of 393 people in the mobile industry – one of the largest IoT surveys to date - on behalf of InterDigital. The survey yielded a wealth of data, some of it confirming views and some challenging accepted views. That fragmentation and interoperability is a major issue is no surprise, and the industry is turning to four clear early standards leaders to provide a foundation. Perhaps in the same vein, and despite early indications that much of the IoT would be non-cellular, the ease of use and global nature of cellular is galvanizing attention. Finally, and surprisingly given the early talk of the tremendous benefits of IoT to primarily industrial economies, global respondents look to America as the early leader.